At first glance, the average person would probably look at the CRF450L and wonder why is it more than double the price of the CRF250L. 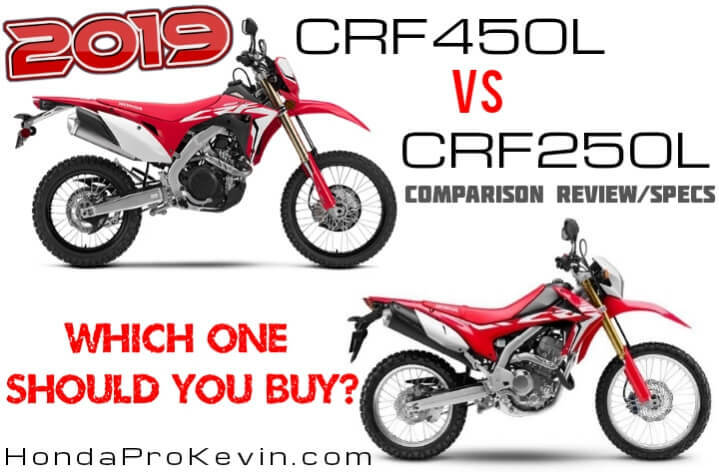 What could there possible be that would justify a price jump from an MSRP of $5,149 on the CRF 250L to a whopping $10,399 on the 450L variant of the CRF? A lot… The CRF250L was designed to be a budget bike from day one. Is that a bad thing? Nope, definitely not as not everyone out there needs some crazy performance version of the motorcycle they would like to ride. The average person doesn’t need the ‘baddest of the baddest’ when it comes to their bike, they don’t mind if steel is used instead of aluminum or titanium or that it has enough in the suspension department to where they could jump it off the roof of their house and they’d be fine. Case in point, the new cheaper and different variations of CBR supersport bikes over the years. Not everyone needs a flat-out track bike like the CBR600RR when they won’t be doing track days or anything along those lines to justify the inflated price because of the technology put to use on that bike so something along the lines of the CBR650F (similar to the old-school CBR600 F4i models) is more than enough for them to just put around town on and to have some fun here and there. In a perfect world, there would be that ‘perfect’ bike for all of us and everything was made to just how we would like it but at the end of the day – that wouldn’t be profitable. Each manufacturer would have to make so many different model variations they would go bankrupt quicker than these new CRF450L bikes are flying off the floor! As you can see, there’s quite a few differences between the CRF450L and CRF250L and it’s not just Honda throwing a larger engine in the CRF250L and calling it a day like many people thought would happen. Every single nut and bolt are different between the two of them. Every single thing has been upgraded to another level whether it be the aluminum frame on the CRF450L versus the steel frame on the CRF250L to shave off weight, upgraded DID Dirt Star wheels, Showa suspension that is light-years ahead of the smaller 250, titanium fuel tank and the laundry list continues on and on for quite some time. Does all of this make the CRF250L a bad bike to buy? Something you shouldn’t consider purchasing now? Most definitely not. It’s still a killer bike, for what it is. A budget dual-sport bike that won’t break the bank as you can find them in the $4,### price-range all day long at dealers discounted from its $5,149 MSRP price. If you don’t need the baddest bike on the planet to hit the trails with, the CRF250L is hard to beat and that’s why it has been a massive seller for Honda since it was originally introduced to the model lineup back in 2013 to replace the CRF230L. Does all of this make the CRF450L a better bike to buy over the CRF250L? Well… It depends. It depends entirely on what YOU want to use the bike for and what you want it to accomplish at the end of the day. The CRF250L is more than enough for the majority of people out there but there are a few people out there that want a true performance orientated street legal dual-sport motorcycle with no corners cut. They want the performance of a CRF450R but legal to hit the roads with whether it be as a dual-sport bike or as many people will be doing with them which is turning it into a supermoto. Hopefully Honda gets on the ball and brings us a production CRF450M motard based off of this CRF450L like they did with the CRF250M based off of the CRF250L that we sadly didn’t get here in the USA but many other countries across the world did. Personally… If I was buying one tomorrow, I would buy the CRF450L over the CRF250L. Why would I do that? Because I have a horrible addiction of pushing it to the limit and I tend to go for the baddest version of whatever is offered whether it be a bike or car etc as I plan on wringing its neck and want the best of the best – IF it makes sense. When would it not make sense? Let’s say, buying the RC213V-S over the CBR1000RR if you were wanting a 1000 cc or larger superbike. If you’re a regular ‘Billy Bob’, spending $150,000+ on the RC213V-S wouldn’t exactly make sense when you can spend around $15,000 (or less) on a new CBR1000RR. Keep in mind, I’m talking about regular people here, not multi-millionaires that can afford spending that large of a chunk of money on nothing but a toy at the end of the day. * One thing to keep in mind. At the time of writing this, Honda has not released the 2019 CRF250L information. I will be posting the 2019 CRF250L details next month on this page —> 2019 Motorcycles / Model Lineup – Click Here. Why am I bringing this up? Because I am technically comparing the 2019 CRF450L and the 2018 CRF250L against each other. Honda, could release a slew of changes to the 2019 CRF250L when compared against the 2018 CRF250L and if that happens then I will update this comparison page as well as break down all of the changes to the 2019 CRF250L VS 2018 CRF250L for you guys. Opinions? What do you guys think about the CRF250L VS CRF450L when you stack them up against each other in a comparison? Is the CRF450L worth almost double the price tag to you?